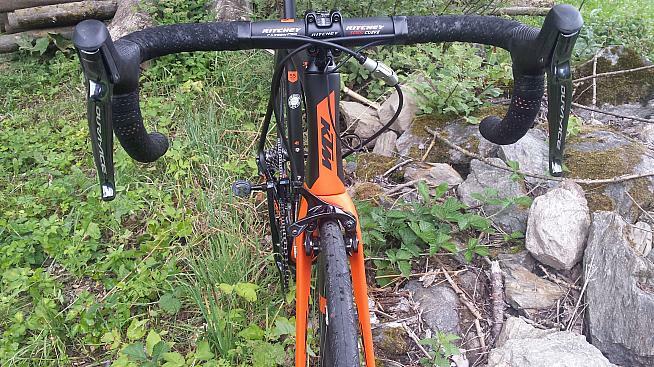 The first time I rode a KTM road bike I came away distinctly unimpressed. Leaving aside that the hood covers were not fitted properly and interfered with changing gears, the bike in question had an unfortunate combination of qualities that made it seem heavy and harsh to ride. It was also expensive in an unfortunate variation on Keith Bontrager's maxim: "Strong, Light, Cheap, pick two". 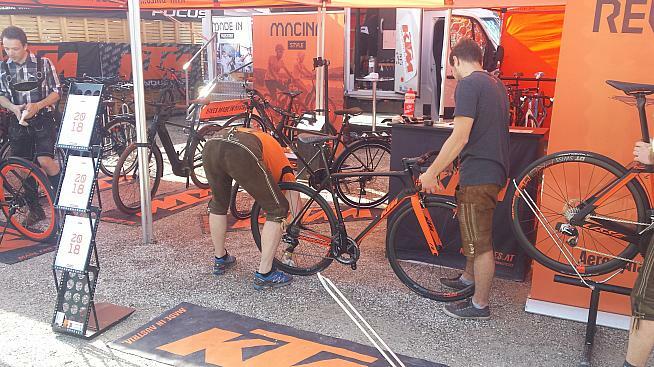 Two years later I approached the KTM stand at the Eurobike Media Days event with low expectations. The low rear brake gives a sleek appearance. The first observations I made in my notebook were: "light, comfortable, smooth," and I stand by that summary. The Alto Prestige is a pound lighter than its fully aero stablemate the Lisse Prestige, more suitable for the mountains and is less radical in appearance. It is far from retro, however, with tubes shaped to cut the wind, internal cable routing down through the down tube and the rear brake mounted low under the chainstays. 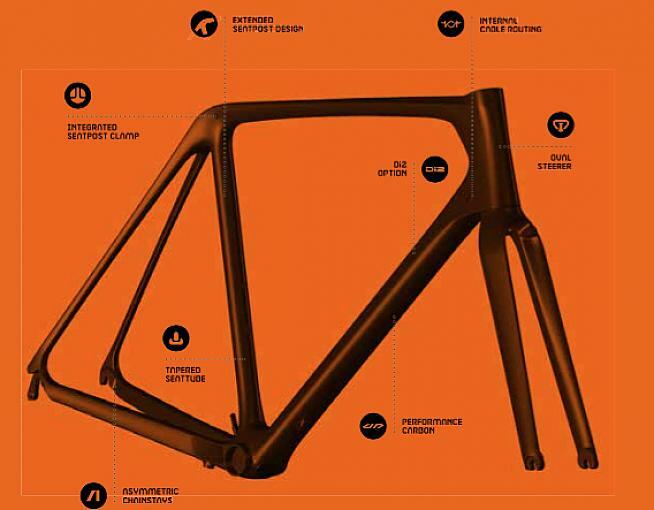 KTM claims that allows the seat stays to be designed for maximum comfort, which in combiation with the long seat post allows the chainstays and bottom bracket to be kept stiffer for power transfer. The only area that lets down the Revelator Alto Prestige are the cables and exposed Di2 battery up front. It looks messy by modern standards. The cabling is not in keeping with the clean look of the rest of the bike. Questions about plans to tidy up the cockpit in the manner of the Lisse where you can't see a single inch of cabling or wiring were met with non-commital replies that could have been driven by a desire to keep plans under wraps (pun unintentional) or they just did not know. My test ride around Kronplatz in the Sud Tirol was lumpy and featured road surfaces of varying quality. The Alto Prestige handled it with grace. 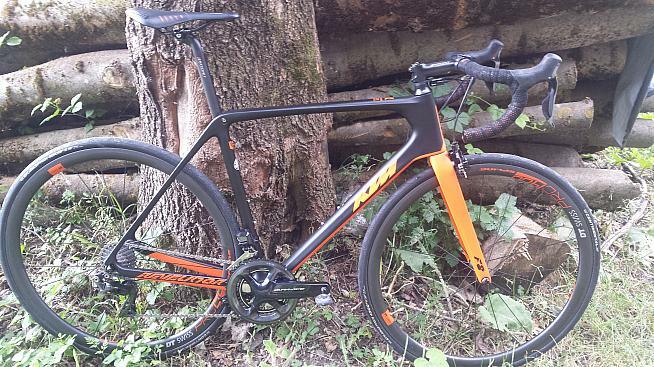 With Shimano Dura Ace Di2 onboard KTM says the Alto Prestige weighs just 14.77lbs / 6.7kg without pedals. It felt like it. It was willing to climb even with this rider's inadequate power being put through the cranks. KTM, which has been in the bicycle business since 1964, has 3,000 dealers and sells 300,000 bikes a year globally. The company is based in and manufactures its bikes in Austria, just across the border from the Sud Tirol. Mechanics in lederhosen is not something you see every day. It's safe to stay the distinctive orange coloring is not a very common site on American roads. KTM officially launched in America in 2016 and has 22 dealers nationwide. Click for a map of stockists here. Additional outlets are being sought, but there are deserts in coverage as you might expect. South Carolina and Kentucky are the shops nearest to the Northeast at the moment. Bikes can be ordered from the KTM website direct and KYM is also keen to recruit ambassadors for the brand. 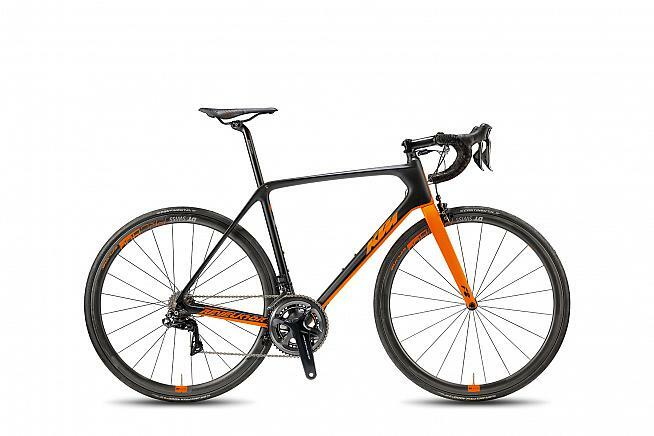 At $8,850 / Euro 6,999 the Revelator Alto Prestige with Di2 is far from cheap. It is also a fantastic bike that I would love to have under me tackling the toughest gran fondos and longest days in the saddle.